The top four finalist teams in the business administration co-op cohort presented their ideas to Dare Foods Limited (Dare) executives during the Spring 2017 Integrated Case Exercise (ICE) finals. 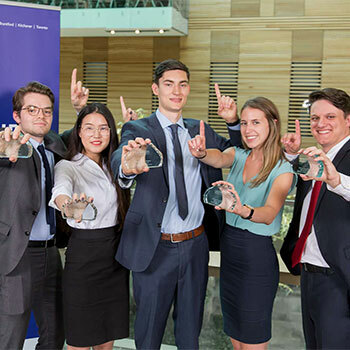 Held twice per year, ICE is a mandatory part of the third year of the Lazaridis School of Business and Economics’ bachelor of business administration (BBA) program that has been taking place for over 40 years. Worth 10 per cent of each grade of the courses taken during the term, 600 students in 100 teams presented their proposals in both reports and live presentations to faculty and alumni judges over the 10-day exercise. The top four teams were selected through multiple rounds of judging to gain the chance to present their concepts to executives from Dare. Dare asked students to come up with creative solutions to drive awareness for their recent (and tasty) innovations in the cookie and cracker categories; Dare provided product packages to all 100 teams to provide them with the opportunity to try the products the teams would be analyzing. The solutions put forward by the finalist teams explored national partnerships with complementary products, linkages with not-for-profit organizations, channel expansion, media outreach, and social media campaigns. Dare executives evaluated each of the four finalist teams using the same criteria they use in evaluating a brand manager’s proposal within Dare: strategic fit with brand and consumer target; prioritization of initiatives and the rationale based on potential for success; size of potential opportunity and the logic of the marketing math; and the creativity of solutions and how they address Dare’s objectives. The winning team comprised of Jacob Darlington, Zachary Guitor, Yuting Pan, Kezia Ramalho and Tyler Raytek. Their creative solution included actually creating a commercial to advertise their proposed partnership with another product-company with similar core values to Dare. The winning team was rewarded with leather briefcases, hoody sweaters, other gifts and gift cards from Dare. All finalists also received a gift card from Dare and hoody sweaters recognizing their position as finalists in ICE.